Starting with the ORIGINAL in 1972, the DURAN® laboratory bottles have continued to evolve to meet the diverse needs and applications of scientists and researchers around the world. 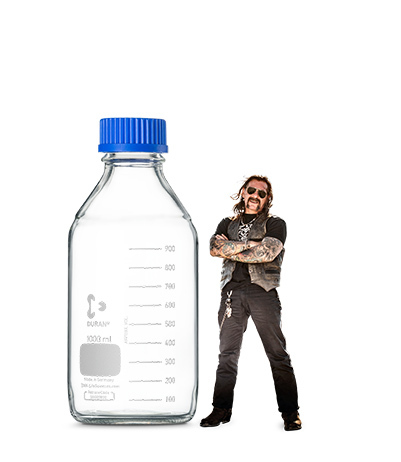 The borosilicate glass 3.3 bottles are now available in the most comprehensive range of volumes and formats. 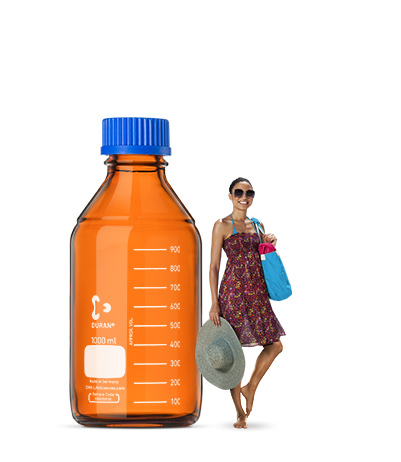 The origin of our bottles and a classic of the laboratory - the DURAN® REAGENT BOTTLE. Made of borosilicate glass 3.3, a special glass invented by Otto Schott in 1887 and registered under the brand name DURAN® in 1938. 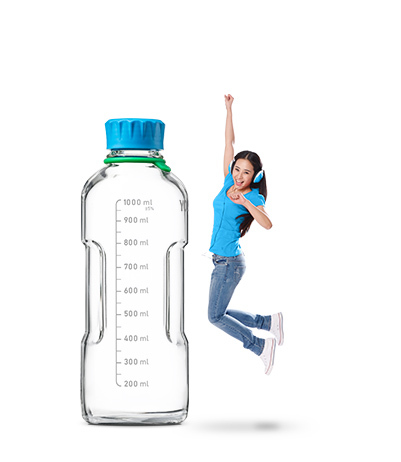 The gold standard of multi-functional laboratory bottles made of a high-purity borosilicate glass 3.3. A combination of high-performance materials and robust design provides a long usable working life. 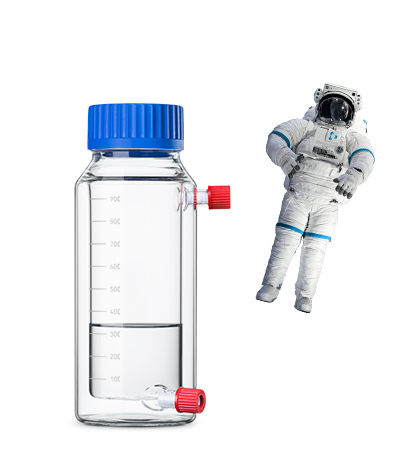 Retaining the best features of the original bottle, this next-generation of laboratory bottles offers improved ergonomic features, user safety, and a dedicated system of useful components. The additional of a fused, external amber layer ensures the contents are protected from the effects of photodegradation. 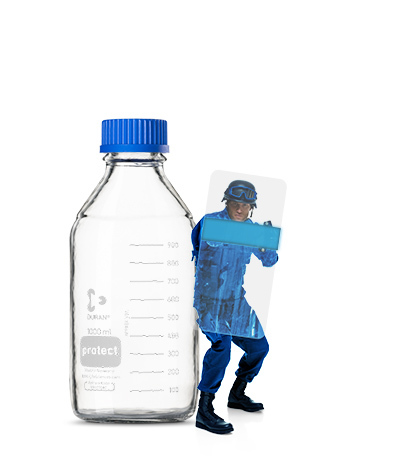 The protection meets international standards and lasts the lifetime of the bottle. 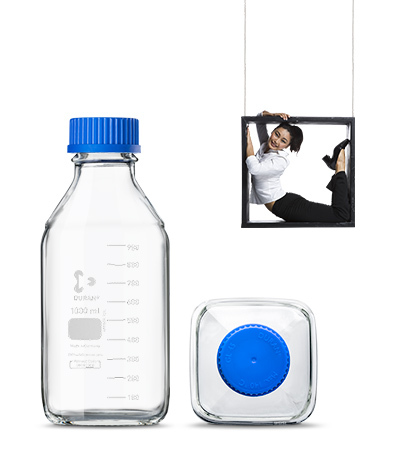 The smart, reusable bottle for cell culture media preparation. The unique design offers two positions: upright for filter sterilization or storage, and tilted at 45° for pipetting in biosafety cabinets. The optimized conical design allows the most efficient delivery of mobile phase to HPLC analyzers. Graduated for easier volume determination. The virtually inert glass prevents leaching of extractables. All the features of the Original GL 45 DURAN® bottles, with the added benefits of a larger mouth. Hassle-free filling, emptying, and cleaning, are just some of the benefits of having easier access. The additional of an external glass jacket to the wide mouth GLS 80® bottle, allows the contents to be conveniently heated or cooled without risk of cross contamination. Combining the best of both worlds, the virtually inert glass protects the contents from contamination, while the external plastic safety coating protects both the user and contents from accidents. A range of high-quality bottles and closures developed for the needs of the pharmaceutical industry. The bottles meet the requirements of the international pharmacopeias and are available with the certificates required by the regulatory authorities. The ultimate bottle for high-efficiency mixing combined with the benefits of the wider GLS 80® mouth. The built-in glass baffles improve top-to-bottom circulation and radial mixing. 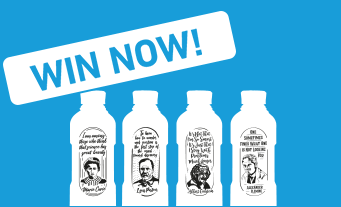 The limited “Genius Edition“ DURAN® YOUTILITY® bottles will be offered in a prize draw from August 2018 till December 2020. Each month 10 bottles will be raffled. BOTTLE* NOT SUITABLE FOR LIQUID RADIUM. * Bottle delivered without liquid Radium. BOTTLE* SUITABLE FOR PASTEURIZED LIQUIDS. * Bottle delivered without pasteurized milk. * Bottle delivered without black hole. Please acquire black hole separately. BOTTLE* RESISTANT TO BACTERIA AFTER FILLING WITH PENICILLIUM NOTATUM. * Bottle delivered without Penicillium notatum. 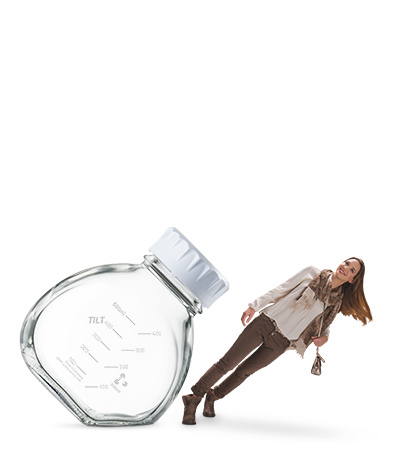 Send us your ideas on how to improve the lab bottle or/and its accessories for a chance to win a limited “Genius Edition“ DURAN® YOUTILITY® bottle. 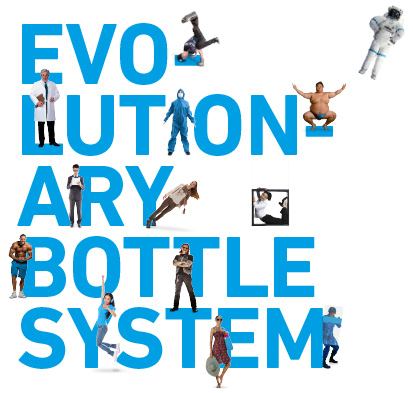 DWK Life Sciences GmbH, Hattenbergstraße 10, 55122 Mainz, Germany, is holding a competition worldwide from August 2018 to December 2020 under the title „Bottle System Evolution“. 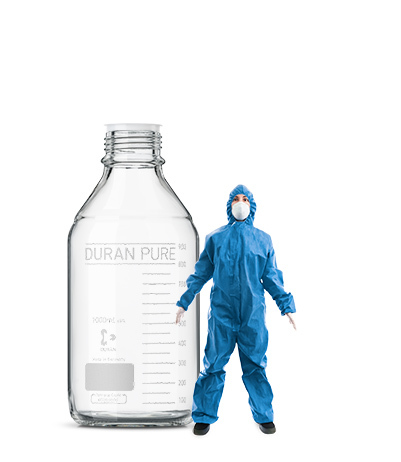 To participate, a proposal for the improvement, modification or evolution of the laboratory bottle or/and its accessories must be submitted to the website: www.duran-bottle-system.com and the participation form must be completed in full. The form contains the fields: Name, company, position, address and e-mail address (there is also a free text field for the proposal). 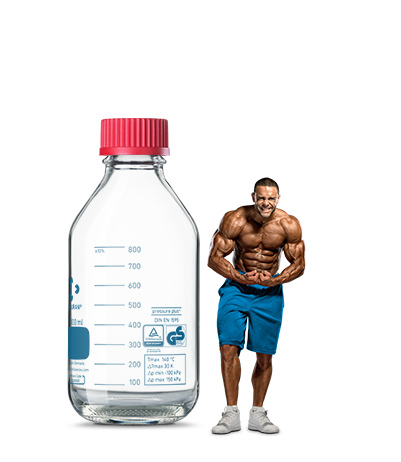 Every participant can win a 500ml bottle of the model „DURAN® YOUTILITY®“ in a limited special edition. Each month 10 bottles will be raffled. Participants from the previous month will take part in each draw. The raffles take place in the middle of each month. Only one prize per participant is possible. Persons over 18 years of age are eligible to participate. Employees of DWK Life Sciences and their relatives, as well as cooperation partners are excluded from participation. Winners will be notified in writing and/or by e-mail. A cash payout, exchange or refund of the prize is not possible. Participation via raffle clubs and automated services is excluded. DWK Life Sciences reserves the right to exclude participants from the promotion due to false information, manipulation or the use of unauthorized aids. Legal recourse is excluded. Participation data will be treated confidentially and in accordance with applicable data protection guidelines. The data will only be used for the delivery of prizes and in the event of necessary queries and will be deleted after the action has been carried out. The participation data will not be passed on to third parties. DURAN® offers a comprehensive product range of precision closure systems, starting with high-quality standard caps suitable for numerous scientific applications. 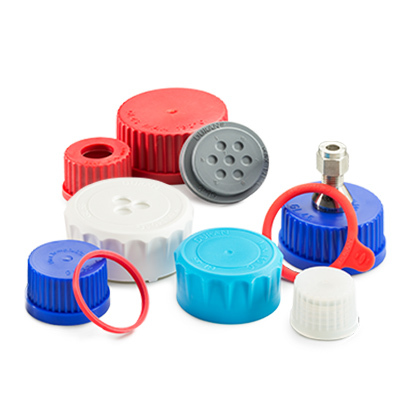 Our range also includes identification aids, special closures for sterilization processes, caps made of high performance materials for demanding applications, connection systems, security caps and transportation accessories. 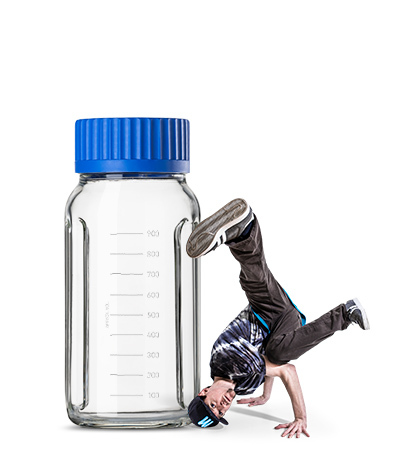 DURAN® caps and connection systems fit most DIN standard laboratory bottles made by other manufacturers. Click and Carry! Our latest innovation – a modular bottle carrying system that focuses on the safety and convenience of users in the laboratory. 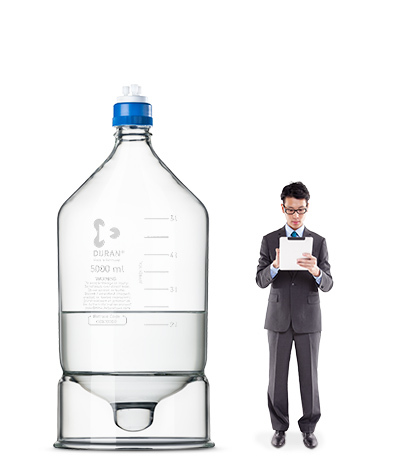 The new modular Bottle Carrying System fits standard laboratory bottles that have a GL 45 neck finish and is compatible with four bottle sizes: 2, 5, 10 and 20 litres. 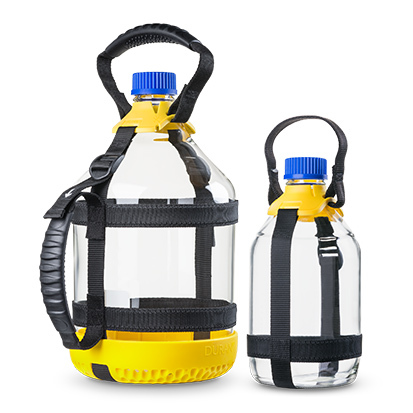 It is ergonomically designed, and offers health & safety benefits to the user and allows easy and safe transport of bottles around the laboratory or production facility. It makes pouring liquids from the larger bottles more comfortable and safer. All materials are fully autoclavable. 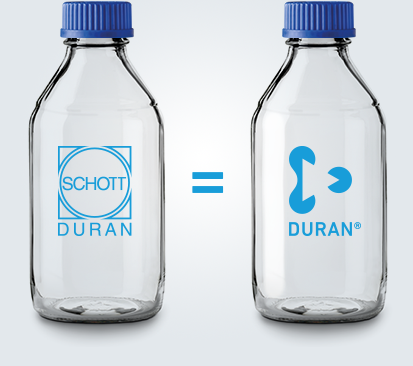 As part of this merger, the SCHOTT DURAN logo will be replaced by the new DURAN® product logo – the product quality remains unchanged.